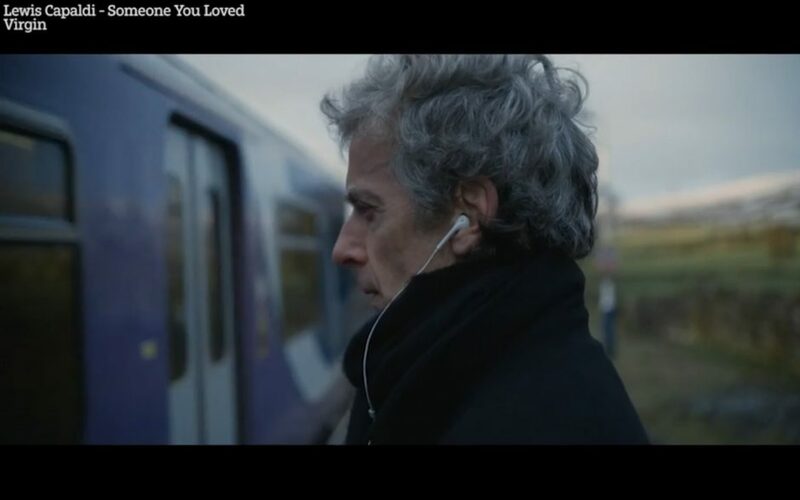 The latest Lewis Capaldi music video has turned Peter Capaldi’s fanbase upside down, and all I can see in my timeline now are posts about ‘Someone you loved’. One scene in particular seems to have made quite an impression on Capaldis’ fans: the opening and closing train scene. I keep reading that the character played by Peter missed the train (because he is too deep in his thoughts, because he is sad…), so let me offer an alternative interpretation, based on the research I did during my PhD, when I studied train representation and symbolism in European Literature. Peter’s character didn’t miss the train, because there was no train to miss in the first place. Did you see the train stop at the station? It didn’t, and that’s why Peter’s character was not supposed to board this train! Opening scene: a train is coming at a distance. A man is standing on a platform, with ear buds suggesting he is listening to music, only all we can hear are heartbeats, and these force us to fear the worse for the character: is he going to jump? Those words are clearly a suicide statement. And yet… the character hasn’t jumped, nor did the train stop. Because the train is a representation of Charon, the ferryman of Hades. But instead of a boat, it is the train that allows dead people to travel from the world of the Living to the world of the Dead. The train doesn’t stop because it’s not the character’s time to die. While the story unfolds, we discover why Peter’s character is going under. He lost someone close to him, and he is grieving. The train scene seems to be the key scene of the music video, because once the story is completed, we find Peter’s character on the same platform as the train passes by, and the character seems to wake up from some sort of day dream. But it is not any day dream. It’s the story of the loss of the woman close to him and how she saved a life in the process. While the train doesn’t stop to take Peter’s character to the world of the Dead, there is, however, a very important passenger on board that very train: the woman Peter’s character loved. She died, and as such, she can travel from one world to the other, using the train that wouldn’t stop for any living person, despite their wish to rejoice with their loved ones. As for the fact that Peter’s character seems to wake up from a dream, it makes sense if you consider that the train has gone. His loved one is gone to another world while he needs to learn to live on this one.